Introduction: Lesions of the jugular foramen are uncommon, and the paragangliomas are the most common tumors in this region, followed by schwannomas. Schwannomas are benign tumors, of slow growth and origin mainly in the sensitive cranial nerves. When located in the jugular foramen, the patients present with clinically auditory hearing loss, ataxia and headache, and cranial nerves IX, X and XI alterations are also common. Surgical excision is the therapeutic choice. Case Report: We reported the case of a young adult patient who sought the Otorhinolaryngology service at the School Hospital of Brasília for investigation of otalgia and chronic infection in the left ear, associated with tinnitus, hypacusis and tumor in the external ear canal. Initial diagnostic investigation by computed tomography and biopsy was inconclusive. New biopsy and magnetic resonance imaging were performed and definitive diagnosis of jugular foramen schwannoma was given. The lesion was then defined as type D by the classification of Kaye-Pellet, for it involved the jugular foramen, presented format of dumbbell and intra and extracranial components. The patient underwent a craniotomy and partial excision of the tumor. He did not have sequels of the procedure, although the otologic symptoms persisted. Final Comments: This case is an example of a rare disease. No more than two hundred cases have been reported in the literature and the clinical presentation is uncommon. The diagnostic and therapeutic challenge is faced by Otorhinolaryngology and Neurosurgery teams who are scheduling a new combined surgical procedure for a complete excision of the tumor. The jugular foramen lesions are rare, and the paragangliomas are the most common tumors of this region (1). The schwannomas are encapsulated, well limited benign tumors of soft surface and slow growth. Sixty percent come from cranial nerves and, out of these, the sensitive nerves are the most frequently involved. The vestibular schwannomas are the most common tumors in the central nervous system, with an annual incidence of 1:100.000 followed by the trigeminal schwannomas (2). The patients with jugular foramen schwannomas present with clinical hearing loss, ataxia and headache, and cranial nerves IX, X and XI alterations are common. The fifth decade of life is mostly affected. The imaging exams are used for diagnostic aid and the therapeutic choice is the surgical excision (1). Schwannomas with origin in the jugular foramen are extremely rare, and there are about two hundred cases described in the literature. They represent 2.9 to 4% of the intracranial schwannomas and less than 4% of all lesions of the temporal bone (3). Thirty-one years old, male, white, married, builder's laborer, born in Cocal / PI, living and coming from Valparaíso / GO. He sought the Otorhinolaryngology service of the School Hospital of Brasília with complaint of otalgia and bloody otorrhea in the left ear associated with constant tinnitus and hypacusis. He mentioned the beginning of the symptoms 6 years ago after fireworks barotraumas. For 2 months, he complained of dizziness, nauseas, vomiting and frontal headache irradiated to the whole cranium. In this period, he presented with three episodes of the syncope. Upon left otoscopy, we observed otorrhea and the presence of a tumor in the external auditory meatus. The summary neurological exam of the patient was normal, as well as the function of all cranial pairs. We performed incisional biopsy, whose histopathological report was of exuberant granulation tissue with areas of fibrinoid material deposit and bacterial colonies associated to an inflammatory granulomatous process and keratin plates. The audiometry showed normal right auditory thresholds with a fall to 8 kHz and left mixed severe hearing loss. The computed tomography showed heterogeneous lesion with important contrast distinction and extensive invasion of the posterior cavity with the bridge contralateral displacement (Picture 1). Picture 1. Mastoid computed tomography - axial cut - showing a heterogeneous lesion invading the posterior cranial cavity with the bridge contralateral displacement. 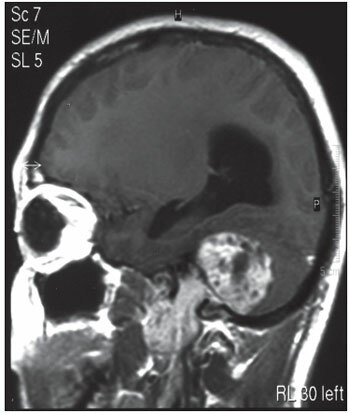 The nuclear magnetic resonance with gadolinium showed expansive, heterogeneous lesion in the cranial base with an intense distinction by contrast, that invaded the paraphayngeal space, temporal bone and right cerebellum, in addition to an important hydrocephaly, compatible with the diagnosis of jugular foramen schwannoma (Picture 2, 3). Picture 2. 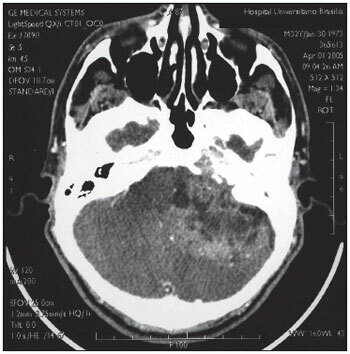 Nuclear Magnetic Resonance with gadolinium - coronal cut - showing an expansive heterogeneous lesion in the cranial base, capturing the contrast intensely. Picture 3. Nuclear Magnetic Resonance with gadolinium - sagital cut - showing a halters-shape lesion with extracranial expansion from the cranial base. A new biopsy was then carried out and the histopathological report was of schwannoma (Picture 4). The immunohistochemical study revealed a diffuse expression of the marker of protein S-100 and not the expression of markers CD34 (antigen of hematopoietic cells and pericits) and NGFR (receptor for nerve growth factor). Picture 4. Photomicrography, H&E 20x. The cores tend to organize themselves in the parallel position. This aspect is called trellis, typical of schwannomas. Picture 5. 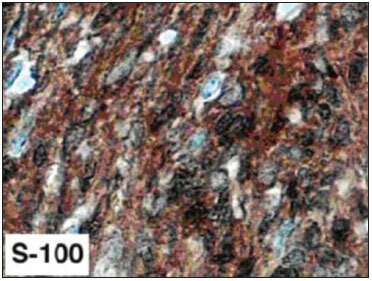 Photomicrography, immunohistochemical 40x. 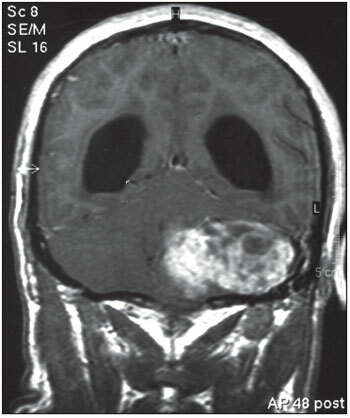 Tumor cell marker, protein S-100 positive, typical of the schwannomas. We chose the patient hospital internment and joint evaluation with the Neurosurgery team. The arteriography confirmed it was a not much vascularized tumor. During internment, the patient evolved with almost constant visual turbidity and intracranial hypertension signals. We carried out ventriculoperitoneal shunt with high pressure valve type Phoenix. The patient evolved with ataxia, vertigo and cerebellar compression signs when he was submitted to subtotal resection of the tumor, whose histopathological and immunohistochemical report confirmed it was schwannoma. Today, there is a persistence of fetid otorrhea and convexity of the external auditory meatus by the tumor and its exteriorization by the external acoustic pore and improvement of unbalance and ataxia without clinical signs of intracranial hypertension. The jugular foramen lesions are rare, and the paragangliomas are the most common tumors in this region, followed by schwannomas, meningiomas, metastases, giant cells tumors, chondrosarcomas, plasmocytomas, epidermoid cysts, amyloidomas and endolymphatic sac tumors that are also described in this location with primary and expansive lesions. The lesions coming from the glossopharyngeal nerve are mostly common in this region, followed by the vacant, accessory, and, more seldom, hypoglossal nerve tumors (1,3,4). Jugular foramen important neurovascular structures, cranial base, upper cervical region and areas of the posterior cavity may be involved by these lesions (4). The aforesaid patient is a rare case, in whom in spite of the considerable extracranial extension, the jugular foramen nerves function was preserved upon clinical exam. The tumors in this region are classified by Kaye et al as for the extension and original region into four types. Type A regards the intracranial origin lesions, with a minimal osseous extension. Type B lesions are the primary ones of the bone with or without intracranial component. Type C lesions are primarily extracranial with minimal extension for cranial bone or posterior cavity. Pellet et al added the so-called type D, which regards the hour-glass-shaped tumor, that involves the jugular foramen, with intracranial and extracranial components. (2,5,6). The abovementioned patient is included in this class. The initial symptoms of the jugular foramen tumors depend on their origin. The late stages clinical presentation results both from the tumor origin and its size and region, and there may occur symptoms regarding the compression of adjacent structures (1,5). The early symptoms of tumors originated in the jugular foramen are, in most cases, hearing loss and tinnitus; as well as in the case reported. Other lesions may cause paralysis of the lower cranial pairs as a first symptom (4). The tumors that expand to the posterior cavity usually manifest primarily with deafness, vertigo and ataxia, by mimetizing lesions with origin in the vestibular-cochlear nerve, a picture exemplified in the evolution of the aforesaid case. For the jugular foramen lesions that expand to extracranial proportions these present with hoarseness, diminishing of the coughing reflex and reduction of the motor strength of the shoulder girdle, symptoms representing the typical jugular foramen syndrome, which was absent in the case reported (1,2,3,7). Imaging exams may indicate the tumor extension, as well as help differentiate between the schwannomas and other jugular foramen tumors, such as meningiomas and paragangliomas. When present, the shape of hour-glass is almost pathognomonic of the jugular foramen lesions. The schwannomas are usually solid, circumscribed and well-delimited, and may cause cystic degeneration or primary cysts. Those of intracranial region differ from vestibular ones because of the involvement of the internal auditory canal. Upon tomography we may view a widening of the jugular foramen with well defined osseous margins. The exam without contrast describes hypo or isodense tumor with a reduced capturing of contrast, features that differ it from meningiomas, that present an important contrast capturing, as well as sclerosis and erosion of the subjacent bone (5). The nuclear magnetic resonance describes hypersignal in T2 and hyposignal in T1, with a strong enhancement after gadolinium administration. It may present as a heterogeneous tumor also by the presence of necrosis or cystic formations (5,7,8). 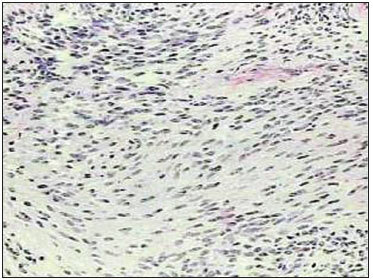 Upon immunohistochemical, the marker diffuse expression of protein S-100 confirms the diagnosis of schwannoma (9). Cerebral angiography may also be accomplished with diagnostic aid. The moderate vascularization occurrence differs the schwannomas from the paragangliomas of such region, which are intensely vascularized (5). The therapeutic approach of this tumor must be multidisciplinary, with intervening neurosurgeons, otorhinolaryngologists and neuroradiologists acting jointly and by allowing for a better diagnostic and pre-operative assessment, in addition to a better management of these patients (1,4). The full surgical resection is still a challenge, in spite of the development of new operative techniques applied to the cranial base. The radical resection with preservation of cranial vessels and nerves is the main therapeutic objective. The tumor extension to the cavernous sinus, clivus or brain stem is a limiting factor to the total removal of the lesion. The jugular foramen tumors are uncommon lesions of the cranial base and the schwannomas in this region correspond to only 2 to 4% of the intracranial schwannomas. This patient is a rare case, both for the uncommon age upon the disease diagnosis, the low incidence and prevalence of his disease, and for his clinical presentation. In spite of the considerable extracranial extension, the function of his nerves of jugular foramen - IX, X, XI - remained integral, even after months of the disease's evolution, with the presence of compressive symptoms in the central nervous system, and surgical intervention. The diagnostic difficulties occurred initially with inconclusive histopathological results, as well as the computed tomography incompatible with the expectation for the schwannomas (heterogeneous lesion with important enhancement by contrast). A new biopsy was necessary with immunohistochemical and evaluation by nuclear magnetic resonance for the definitive diagnosis. The therapeutic challenge is faced by Otorhinolaryngology and Neurology teams and the lesion initial partial surgical excision and installation of ventriculoperitoneal shunt were chosen for resolution of the acute picture of intracranial hypertension and reestablishment of the clinical condition. The patient, who presents with postoperative sequels, in spite of the otologic symptoms, must be soon submitted to a new combined operative procedure in an attempt to the entire removal of the tumor. 1. Resident of the ORL Service - UnB. 2. Doctoral Degree in Health Sciences. Assistant Doctor of the ORL Service UnB. 3. Master's Degree in Health Sciences - UnB. Assistant Doctor of the ORL Service - UnB. 4. Head Professor of the Otorhinolaryngology Discipline of the University of Brasília. Institution: Serviço de Otorrinolaringologia Hospital Universitário de Brasília - HUB Universidade de Brasília - UnB. Brasília / DF - Brazil. Article received on February 11, 2008. Approved on August 23, 2008.